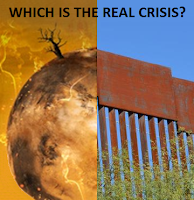 The climate crisis is a real emergency the border wall is not. The window of opportunity to act on climate change is closing. Despite warnings from scientists, we are not seeing enough action from governments, especially the US federal government. We are on the cusp of civilization altering tipping points from which we will not be able to recover yet US President Donald Trump is preoccupied with building a border wall. He has denied the existence of climate change, while threatened to declare a state of national emergency to build his wall. He has pledged to withdraw from the Paris climate agreement while his administration has systematically dismantled environmental protections and climate action. Trump has shut down government over his demand for a border wall even though most experts agree that his wall will not stop the inflow of drugs or illegal immigration. Although walls are not the answer to these problems they will exacerbate existing crises. We are facing an extinction crisis and the border wall would further threaten both flora and fauna. This is one of the many reasons that Trump and the GOP are described as having a "pro-extinction agenda". The Trump presidency exists in an alternate reality that is at odds with science and common sense. Two reports in November warned of the catastrophic consequences of climate change. The UN Emissions Gap Report made it clear that nations are not doing enough to address catastrophic climate change and the second volume of the Fourth National Climate Assessment by the US Global Change Research Program spelled out the costs. In December the annual United Nations Climate Change Conference of the Parities (COP24) in Katowice Poland fell short thanks in part to the efforts of the Trump administration. First there was resistance from oil producing states (the United States, Russia and Saudi Arabia) that succeeded in undermining the UN climate report then inaccurate economic arguments managed to dilute the final outcome statement. In response to the combination of urgent warnings from the scientific community and insufficient action at COP24 some have turned against the UN climate process. "The climate crisis is a race against time and one that we are losing," says climate campaigner Kit Vaughan. "Only a radical revolution of citizen action can deliver real change in the limited time that we have left to save the Planet from climate chaos". Vaughan is an NGO climate activist and a board member of the Climate Action Network. For more than a decade he has been working in and around the UNFCCC climate negotiations. Vaughan says that the COP talks give us false hope. They suggest that we are dealing with the crisis when we are not doing anywhere near what we must to respect the scientific limits agreed to at COP21. Pessimism is well warranted in the face of rising sea levels, mass extinctions, wildfires, and extreme weather. Vaughan points to the massive divide that separates the COP24 proceedings and the scientific reality. Although fossil fuels are at the core of the climate crisis, Vaughan points to the insanity of allowing the US to promote coal at the conference. "After 11 years working in the UN climate talks I have come to a radical but honest conclusion, the UN climate process is, frankly, totally broken....After much deliberation I have realized that my participation and engagement in the climate talks is in itself an act of co-option and makes me complicit in the green washing of the talks as a solution to the climate crisis. Don’t get me wrong; many of the people in and around the talks are well-intended and we must also maintain multilateral talks to tackle the existential threat of trans-boundary climate pollution. But with time for planetary survival running out, we require a new form of honesty, one that allows the world to know that the talks are in crisis and not a part of the solution but now a part of the problem." Vaughan does not believe that well meaning nations, NGOs and businesses can save us from impending global disaster because they have been "co-opted by the process itself - intent on preserving their own egos and institutional objectives - that they can no longer speak truth to power." "We can start to change the way we hold talks by no longer tolerating any fossil fuel lobbyists in the talks; kick them out and open up more space for transparency and civil society action. Historical responsibility and climate justice must again become a pillar of the negotiations, putting the onus on those countries that have (and continue to have) the biggest culpability for causing the problem and make them pay their share of the bill." Vaughan believes there is a lot we can learn from the LGBT community, women, the divestment movement, the yellow-vest protestors, the extinction rebellion movement, student protests, and Indigenous peoples protests. It is hard to refute the fact that we are not doing what we must. Nor is it easy for us to countenance this failure. Many of us realize that this is a "deadly serious race against climate chaos". Vaughan wants to see people empower themselves and get engaged in the political process so that we can act in a timely fashion. As Vaughan explains, this is one race we cannot afford to lose. The border wall is a political ploy and not an emergency. This is yet another installment of Trumpian tactics designed to inspire fear and cleave divisions. This cynical move is being used to manipulate the public and ensure that legitimate concerns are ignored. In the face of real emergencies we cannot afford to be distracted by the antics of a president whose only goals are self enrichment and avoiding prison time.